Zeeland (/ˈziːlənd/; Dutch pronunciation: [ˈzeːlɑnt] (listen), Zeelandic: Zeêland [ˈzɪə̯lɑnt], historical English exonym Zealand) is the westernmost and least populous province of the Netherlands. The province, located in the south-west of the country, consists of a number of islands and peninsulas (hence its name, meaning "Sealand") and a strip bordering Belgium. Its capital is Middelburg. Its area is about 2,930 square kilometres (1,130 sq mi), of which almost 1,140 square kilometres (440 sq mi) is water, and it has a population of about 380,000. The County of Zeeland (Dutch: Graafschap Zeeland) was a county of the Holy Roman Empire in the Low Countries. It covered an area in the Scheldt and Meuse delta roughly corresponding to the modern Dutch province of Zeeland. The County of Zeeland did not include the region of Zeelandic Flanders which was part of Flanders; conversely, the modern Province of Zeeland does not include Sommelsdijk, historically part of the County of Zeeland. The De Hoed Mill is a post mill in Waarde, in the South Beveland region of the Netherlands. The structure was originally built as an oil mill in the town of Gent in 1550, and was converted to a corn mill in the late 17th century. The mill was moved to its current location in 1989. The windmill is listed as a protected structure under rijksmonument number 32419. The Eastern Scheldt (Dutch: Oosterschelde) is a former estuary in the province of Zeeland, Netherlands, between Schouwen-Duiveland and Tholen on the north and Noord-Beveland and Zuid-Beveland on the south. It is also the largest national park in the Netherlands, founded in 2002. Goes (pronunciation ) is a city and municipality in the southwestern Netherlands on Zuid-Beveland, in the province of Zeeland. The town of Goes has approximately 27,000 residents. A list of windmills in the Dutch province of Zeeland. Middelburg (Dutch: [ˈmɪdəlbʏrx] (listen)) is a city and municipality in the south-western Netherlands serving as the capital of the province of Zeeland. Situated on the central peninsula of the Zeeland province, Midden-Zeeland (consisting of former islands Walcheren, Noord-Beveland and Zuid-Beveland), it has a population of about 48,000. In terms of technology, Middelburg played a role in the Scientific Revolution at the early modern period. The city was historically a center of lens crafting in the Golden Age of Dutch science and technology. The invention of the microscope and telescope is often credited to Middelburg spectacle-makers (including Zacharias Jansen and Hans Lippershey) in the late 16th century and early 17th century. The Oude molen does mean ''Old Mill'' in Dutch. Is a windmill in Kruiningen in the Dutch province of Zeeland. The windmill was built in 1801 and remained in operation until 1953. In 1959 it was purchased by the municipality. Between 1964 and 1965, and between 1986 and 1992, the mill was completely restored. In 2001 the mill as a whole was moved a little after the windage on the old spot was affected. A voluntary miller, the mill is in operation regularly. The rods of the mill are approximately 20.70 meters long and feature the traditional Dutch fencing with sails. The mill is equipped with two pairs of millstones. Schouwen-Duiveland (Dutch pronunciation: [ˌsxʌuʋə(n)ˈdœyvəlɑnt] (listen)) is a municipality and an island in the southwestern Netherlands province of Zeeland. The municipality has 33 737 inhabitants (January 1, 2016) and covers an area of 488.94 square kilometres (188.78 square miles) (of which 257.87 square kilometres (99.56 square miles) is water). The northside of the island has two fixed connections to Goeree-Overflakkee, the Brouwersdam and the Grevelingen. The southside has two fixed connections to cross the Oosterschelde to North Beveland, the Stormvloed Kering or Oosterscheldedam, part of the Delta Works and the Zeeland Bridge. The island is mostly flat and is, besides a small area, below the sea level. On the western tip is a dune chose highest point is about 42 meters above sea level. The island is, in the summer, very popular with (German) tourists. The Renesse area is a popular holiday destination for young people. The Brouwersdam is a dam, part of the Delta Works, from Schouwen-Duiveland to Goedereede, the west part of the island of Goeree-Overflakkee in South Holland. Sluis (Dutch pronunciation: [slœys] (listen); Zeelandic: Sluus, Dutch pronunciation: [slys]) is the name of both a municipality and a town located in the west of Zeelandic Flanders, in the south-western part of the Netherlands. The current incarnation of the municipality exists since on 1 January 2003. 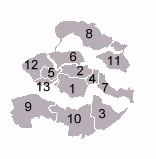 The former municipalities of Oostburg and Sluis-Aardenburg merged on that date. The latter of these two municipalities was formed from a merger between the previous municipality named Sluis and the former municipality of Aardenburg. Terneuzen (Dutch pronunciation: [tɛrˈnøːzə(n)] (listen)) is a city and municipality in the southwestern Netherlands, in the province of Zeeland, in the middle of Zeelandic Flanders. With over 55,000 inhabitants, it is the most populous municipality of Zeeland. Tholen (pronunciation ) is a 25,000 people municipality in the southwest of the Netherlands. The municipality of Tholen takes its name from the town of Tholen, which is the largest population center in the municipality. The municipality consists of two peninsulas, formerly islands, the larger one on the south also called Tholen, the smaller one on the north called Sint Philipsland. The two are separated by the former strait, now bay, of Krabbenkreek. The municipality is bordered on the east by the Eendracht, once a Scheldt branch but now part of the Scheldt-Rhine Canal, crossed by three road bridges, by the Oosterschelde estuary to the south, the straits of Keeten-Mastgat to the west and the Krammer strait to the north. The town has a small historical center partly surrounded by a "gracht" and partly bordered by a harbour for fishing boats and yachts. Veere (Dutch pronunciation: [ˈveːrə] (listen); Zeelandic: Ter Veere) is a municipality with a population of 22,000 and a town with a population of 1,500 in the southwestern Netherlands, in the region of Walcheren in the province of Zeeland. Vlissingen (Dutch pronunciation: [ˈvlɪsɪŋə(n)] (listen); Zeelandic: Vlissienge; historical name in English: Flushing) is a municipality and a city in the southwestern Netherlands on the former island of Walcheren. With its strategic location between the Scheldt river and the North Sea, Vlissingen has been an important harbour for centuries. It was granted city rights in 1315. In the 17th century Vlissingen was a main harbour for ships of the Dutch East India Company (VOC). It is also known as the birthplace of Admiral Michiel de Ruyter. Vlissingen is mainly noted for the yards on the Scheldt where most of the ships of the Royal Netherlands Navy (Koninklijke Marine) are built. Walcheren (Dutch pronunciation: [ˈʋɑlxərə(n)] (listen)) is a region and former island in the Dutch province of Zeeland at the mouth of the Scheldt estuary. It lies between the Eastern Scheldt in the north and the Western Scheldt in the south and is roughly the shape of a rhombus. The two sides facing the North Sea consist of dunes; the rest of its coastline is made up of dykes. Middelburg lies at its centre; this city is the provincial capital and Vlissingen 9 kilometres (5.6 mi) to the south is the main harbour. The third municipality is Veere. Zeeland ( ZEE-lənd) is a city in Ottawa County in the U.S. state of Michigan. The population was 5,504 at the 2010 census. The city is located at the western edge of Zeeland Charter Township. Its name is taken from the Dutch province of Zeeland. Zeelandic (Zeêuws; Zeeuws in Dutch) is a Low Franconian dialect of Dutch spoken in the southwestern parts of the Netherlands. More specifically, it is spoken in the southernmost part of South Holland (Goeree-Overflakkee) and large parts of the province of Zeeland, with the notable exception of eastern Zeelandic Flanders.. It has notable differences mainly in pronunciation but also in grammar and vocabulary, which separates it clearly from Standard Dutch. They make mutual intelligibility with speakers of Standard Dutch difficult. Zeelandic Flanders (Dutch: Zeeuws-Vlaanderen [ˌzeːu̯sˈflaːndərə(n)] (listen), Zeelandic: Zeêuws-Vlaonderen /ʑɪːws ˈvlɒ̃dr̩n/) is the southernmost region of the province of Zeeland in the south-western Netherlands. It lies south of the Western Scheldt that separates the region from the remainder of Zeeland and the Netherlands to the north. Zeelandic Flanders is bordered to the south by Belgium. Zierikzee (Dutch pronunciation: [ˈziːrɪkseː]) is a small city in the southwest Netherlands, 30 km southwest of Rotterdam. It is situated in the municipality of Schouwen-Duiveland, Zeeland. The city hall of Schouwen-Duiveland is located in Zierikzee, its largest city. Zierikzee is connected to Oosterschelde through a canal. In 2001, the town of Zierikzee had 10,313 inhabitants. The built-up area of the town was 3.0 km², and contained 4,295 residences. The statistical area "Zierikzee", which also can include the surrounding countryside, has a population of around 10,730.